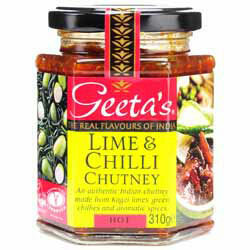 An authentic Indian Chutney made from Kagzi Limes, Green Chillies and aromatic spices. 'This tangy hot chutney is delicious and ideal for those preferring something a little hotter. Made with fresh Kagzi Limes, Green Chillies and Finest Spices to my own traditional recipe, it can add a special touch to any meal. With all natural ingredients - it is truly an exciting eating experience. Ingredients: Kagzi Limes (50%), Sugar, Green Chillies (12%), Crushed Mustard Seeds, Fenugreek Seeds, Spirit Vinegar, Chilli, Turmeric, Cumin. "Dear Spices of India, I have had two large deliveries from this fabulous company. Firstly, every item is individually wraped. The items are as advertised and fresh produce is really fresh. Both orders were packed better then an order I received from the Queen's grocer ;-) I am very impressed. They take great pride in the way they do business and the excellent products they provide. But please don' take my word for it. Just place your order and you will receive a service second to none. Love the Indian sweets :-)) Thank you Spices of India!"